That photo is of Brent Peterson winning a faceoff against Wayne Gretzky. There was a time when Peterson was a faceoff specialist and defensive center for over 600 NHL games. He went on to become a valuable coach. But it his battle with Parkinson's Disease that may be his most inspiring story. After being a first-round draft pick of the Detroit Red Wings in 1974, Brent Peterson embarked on a successful National Hockey League playing career that lasted 11 seasons. During his career, he played for Detroit, the Buffalo Sabres, Vancouver Canucks, and Hartford Whalers. When he retired as a player, Brent immediately became an assistant coach with the Whalers before moving back to Portland, Oregon to become the head coach of the Portland Winter Hawks of the Western Hockey League. After leading Portland to the Memorial Cup championship in 1998, Brent wanted to pursue his dream of becoming a head coach in the NHL, so he left Portland and took an assistant coaching position with the expansion Nashville Predators. Brent was later promoted to the position of associate head coach. Soon after that promotion, things took a turn when Brent was diagnosed with Parkinson’s disease, a degenerative neurological disorder for which there is no known cure. For a year Brent and his wife Tami kept Brent’s diagnosis a secret, even going so far as to borrow the money needed for medications so that they did not have to use Brent’s insurance out of fear that the Predators would find out about his condition. When Brent’s symptoms became more obvious to the people who were around him every day, he and Tami made the decision to go public with the information that would likely end any chances of a team hiring him to be their head coach. Brent made the news public first by telling the Predators following their elimination from the playoffs in 2004. The team rallied around the affable coach they call Petey. In addition to keeping his position as Nashville’s associate head coach, Brent established the Peterson for Parkinson’s Foundation in hopes of raising awareness and funding for research. Away from the ice, Brent received some counseling from Michael J. Fox, one of Parkinson’s most visible faces. It was that same advice that Brent turned around and gave to former NBA star Brian Grant after he too was diagnosed with the same disease. Like Brent, Grant struggled with the emotional trauma of having been diagnosed with Parkinson’s at such a young age. At Brent’s urging, Grant established a foundation of his own. Early in the 2010-11 NHL season, Brent’s symptoms became more and more difficult to manage. His balance was affected, making it dangerous for both him and the players to be out on the ice together. Following Nashville’s elimination from the 2011 playoffs, Poile announced that the team had made the decision that Brent would no longer be a coach. The Predators kept Brent on staff though, creating the position of hockey operations advisor to tap into Brent’s years of experience in working with the players. Those same symptoms that made Brent step away from behind the bench were also affecting his quality of life, and the decision was made to undergo the radical medical procedure called Deep Brain Stimulation. DBS is a series of four medical procedures that involve wires being surgically implanted into the brain and then connected to a device inside of the patient’s chest. That device sends signals to the brain, and those signals mimic the effects of the chemical dopamine. The results were nearly instantaneous. The morning prior to the system being turned on, Brent needed assistance getting his shoes and socks on before traveling to the hospital. The next day, he was running on a treadmill at the Predators’ practice facility. DBS is not a cure for Parkinson’s, but it does replicate the effects that medication has on a patient. Brent still has Parkinson’s and probably always will. 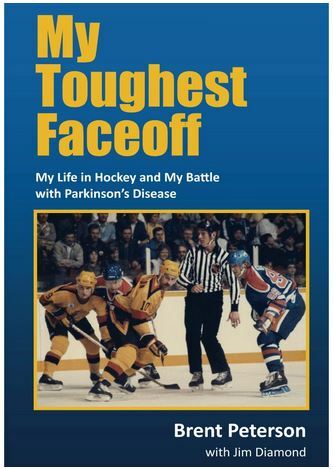 The symptoms will reappear at some point and his condition will likely worsen again, but now he has a renewed outlook on life and a renewed ability to do the things that drive him; being a good husband, father, hockey man, and advocate for Parkinson’s patients everywhere.